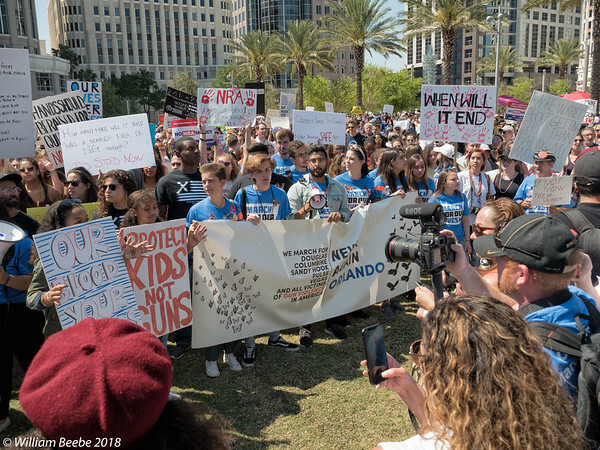 We all know – especially those of us in Orlando – about the shooting deaths of seventeen students on 14 February at Marjory Stoneman Douglas High School down in Parkland, Florida. It was the same horrific senseless killing we’ve all come to see too often, perpetrated by a young white male with a “lawfully” purchased assault rifle, in this last case an AR-15. But rather than fade away in shock, the students of MSD High School have decided to do something about fixing the real problem, a near total lack of sane gun control. And so they’ve been marching and protesting across the country. Their spirit has taken hold all over the state, the country, and the world. This last Saturday, 24 March, we all Marched Four Our Lives. 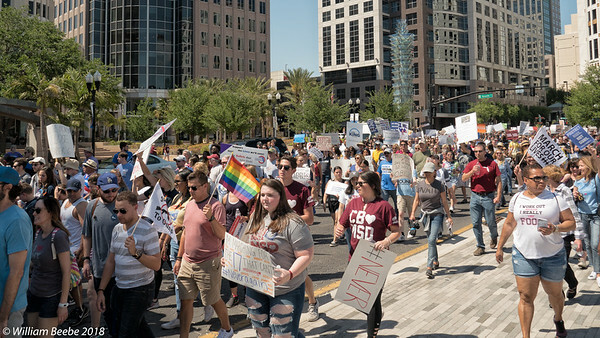 The march in Orlando had at least 25,000 participants. 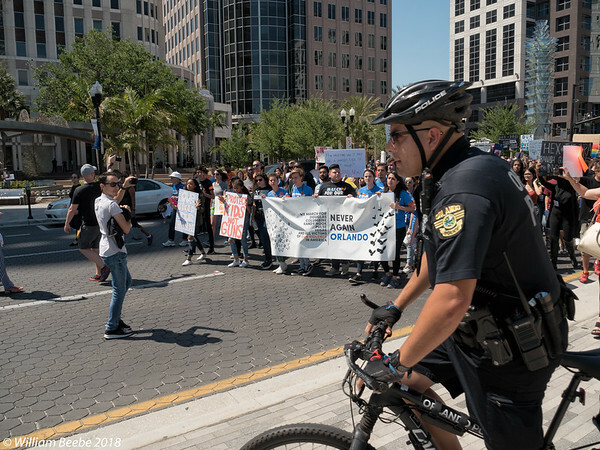 The marchers met for a rally at Lake Eola Park, then marched down East Central Blvd to Orange Avenue, then south to the Dr. Phillips Art Center where they rallied a second time. Judy and I went to participate. We parked next to the Art Center where I left Judy in her chair, then I walked up to Lake Eola where I listened a bit to the rally, took some photos, then walked back to wait for the march. These first photos are from that march down Orange Avenue right at the Art Center. Orlando Police were out in a big way. Mostly riding bikes, making sure that nothing happened to anyone and that the assemblies and march were peaceful. And they were. I know of no incidents the entire time I was there, and I haven’t read of any since then. The police were pretty cool the whole time. 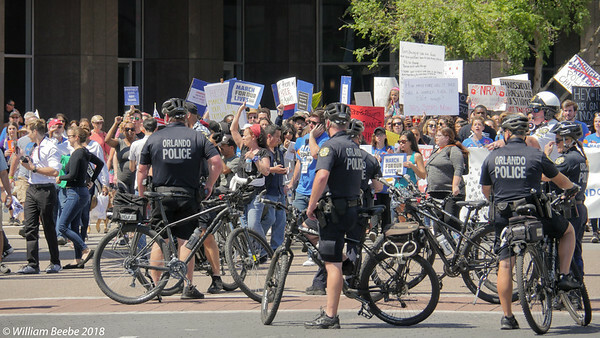 I’m reminded of the Occupy Orlando march; a lot of participants, a lot of energy in the crowd, and a lot of Orlando Police keeping everything calm and cool. 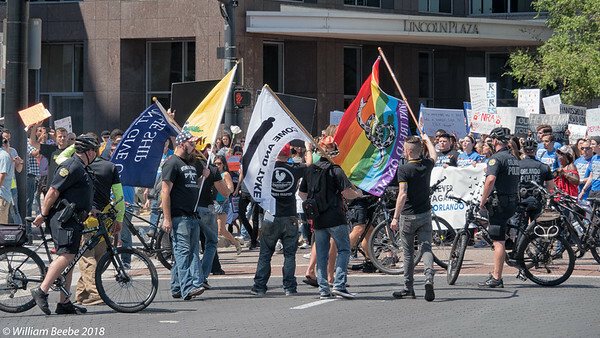 And, of course, we had our “counter protesters.” The alt-right assholes were out exercising their First Amendment rights, but they were pathetically few. I think this was the largest group of them (maybe a half-dozen) I saw the entire time I was there. They were flanked on both sides by Orlando Police, along with quite a few more outside of the photo frame. And the marchers came, and they kept on coming. There were a lot of energized folks at the rally and who marched to the Art Center. Once the march leaders got to the Seneff Arts Plaza they stopped and congregated around, chanting while the marchers built up around them. It was a pretty impressive, peaceful, and positive political action, and all due to high schoolers. Who would have thought it would take a teenager to get an old man like me politically fired up again? Make no mistake: enough is enough. One of the casualties of this will be our very own Marco Rubio, or “Little Marco” as The Donald liked to insult him as. He’s on the record as opposing what the kids and their supporters stand for, so he has to be replaced. He will not politically survive his next senate race in 2020. I will personally help see to that. I have a lot more photos from Saturday, and a lot more to think about before posting anything. I’m still processing so much. When the Raspberry Pi foundation announced the release of the new Raspberry Pi 3 Model B+, I ordered two from element 14 (element14.com). They were the only vendors at the time who had them in stock for the standard price of $35. When I received them I discovered that when they say the 3B+ needs 5V/2.5A, they really mean 2.5A, not 2.4A like I’d been using before. So I went back online and order a pair of new power supplies, along with two Samsung PRO Plus microSDHC 32GB cards. I also discovered via the dreaded red flashing power LED (four flashes) that the older Samsung EVO+ 32GB microSDHC cards would not boot the 3B+ fully. I don’t know why as they work just fine on every other earlier Raspberry Pi I own, up to and including the prior 3 Model B. Interestingly I didn’t have boot issues with any of the SanDisks I was using, just that particular card brand and model. I also ran into an issue updating all my Arch Linux ARM Raspberry Pi systems. They all failed to update (pacman -Suy), and they all failed when attempting to get the catalog from the community repository. A bit of checking on the official Arch wikis turned up nothing. This isn’t the first time I’ve faced this update failure and been forced to reinstall Arch as a consequence. This time, rather than reinstall Arch, I decided to switch completely to the “official” Raspberry Pi distribution, Raspbian. Raspbian has undergone considerable polish over the last 12 months, to the point where I can easily live within the Raspbian graphical desktop. The desktop has a very nice file browser, terminal, and the Chromium browser is now up-to-date with equivalents across all operating systems. I installed Raspbian by pulling down the image file and using Etcher, all of this on my Ubuntu 16.04 notebook. 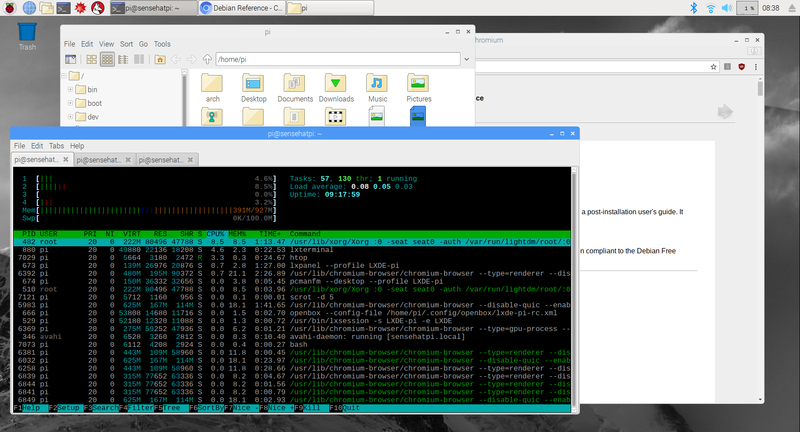 It’s extremely easy to load-and-go with both Raspbian and Etcher. Before I wiped and reloaded, I made full backups of the older /home/alarm home directories to pick up all my earlier work, then copied them back to the pi account home directory via a separate folder. With Raspbian everything seems to be working just fine. 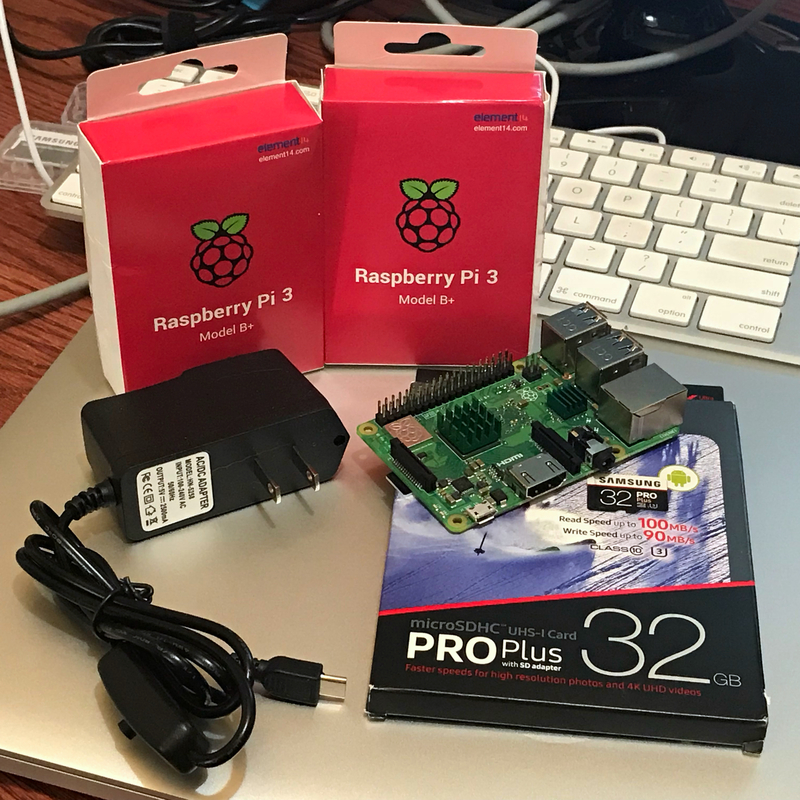 I was even able to start this post on the older Raspberry Pi 3 Model B using Chromium, although I finished the post on my Mac. I had to transfer a photo I took using my iPhone via Google Drive, and I could have done it on the Pi, but I’m a Mac addict, and I wanted to run something undisturbed on the Pi. One test I ran was using the tools I wrote in Python for the Sense HAT. I won’t go into the details of how I got the Arch Linux ARM set up to work, but I will say that Raspbian was already set up out-of-the-box to run my Python code unmodified with the Sense HAT plugged into the board, and without installing and/or configuring any other Raspbian packages. I look forward to moving my C++ based Pi code over. One other observation: The 3B+ runs warm, much warmer than any other Raspberry Pi. I’ve done nothing to tweak the operating frequency of the board. My advice is to buy the heat sink kit for the Raspberry Pi and attach it to the board.